After much anticipation, I'm sure, I have come to post my review on cupcake shops in the greater Mesa area. I'm expecting you all to be thrilled. Sprinkles is the original! It's classy and cute and there are always fun flavors. So.. the S'mores cupcake...this little beauty was a chocolate cupcake with some buttery graham cracker stuff in the bottom and some marshmallow stuff lightly toasted on the top. The surprise came when I got to the middle and there was a dark chocolate truffle stuff in the middle. Dang it was good. The ambiance was lacking in that there was nowhere to sit inside. It was busy and we ended up eating outside on the sidewalk by the bus stop. Not too fun. The upside is that across the street is Fashion Square, the sweetest mall around. Among other things there is a Neiman Marcus, a HUGE Nordstrom, H&M, Bare Escentuals, you get the picture. 2270 E. Williams Field Rd. Caketini is great fun in that all the cupcakes are big and fancy. Chocolate cupcake, peanut butter frosting, chocolate and peanut butter chips, and topped off with a chocolate drizzle. The Diet Coke didn't hurt either. The people were super nice and the environment was cute. There were plenty of seats inside and out. This one is in San Tan Village with lots of fun, outdoor shops. The cool thing about this shop is that you can buy a plain cupcake and "top it" yourself with frosting and candy and stuff. This would be great for little kids and such. I opted for the french toast cupcake. Honestly, I've had better. I didn't really taste anything besides a vanilla cupcake with a little cinnamon. The frosting definitely had some shorting in there, which I do NOT like. There was no shopping around and therefore, not a whole lot to bring me back. Well...as you see, there are no pictures of cupcakes here. I'm not sure why you would call your place Sweet CAKES Cafe if there is no cake. But, I still had to get something, so I settled for this peanut butter M&M cookie and cinnamon roll. A big sacrifice right? They were both good. The cafe also had lunch food, which apparently is great, but I had no time for lunch that day. There was seating outside on the street. It is in the cute downtown area, which I like. There was also seating inside, but it was too loud and noisy at the lunch hour to be very appealing. I saved the best for last. The Coffee Shop is right next to Joe's Farm Grill and is sort of a sister restaurant. Ingredients are locally grown and wonderful. I got a vanilla/strawberry vegan cupcake and it was grand. There was coconut oil in the frosting and it added a great flavor dimension and texture. 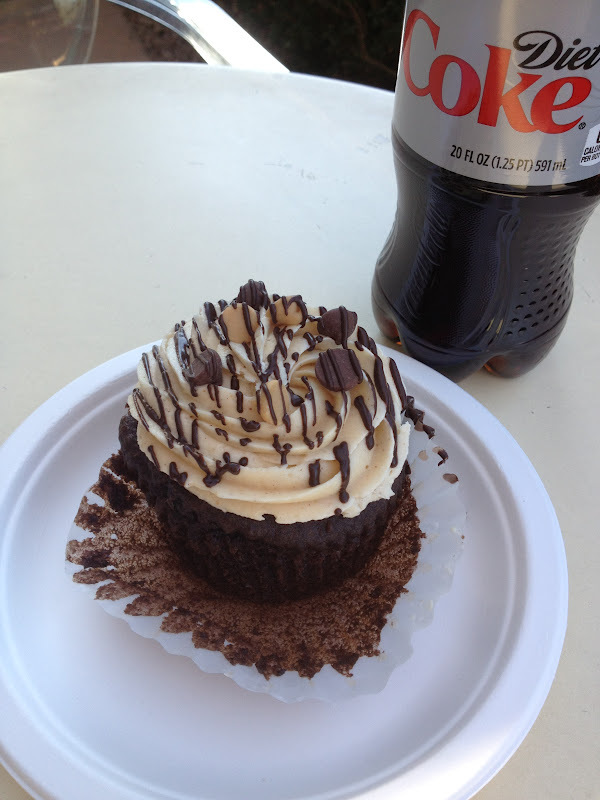 The cupcake was one of the best I had in AZ and it was nice to know that it was sort of healthy too. I also got a sandwich, which was wonderful. It had mayo, fresh basil, provolone cheese, feta, avocado, and tomato. SO GOOD. The best part BY FAR was the beautiful surroundings. Turns out, I'm not a desert girl. I missed the green and flowers of home. It's one of those things you don't notice until you see grass again and feel that void you didn't know was there being all filled up. There were flowers galore and a little patio with roses all around. There was grass and benches for sitting and watching kids play. Even though it was a busy lunch hour, it was not too loud or crowded feeling. I grabbed an outside table and enjoyed the shade and great weather. Inside was cute too, with lots of places to sit. Take a look inside and you'll see. It's the kind of place I could write a book in. And while we're talking about cupcakes, here are some I made for Easter. LOVE the tour! And your EAster cupcakes are darling. You should post THEM on pintrest!! I agree the Easter cupcakes were so sweet looking! I'll have to attempt them next year. I also echo you're thoughts on green and living plants--they life your spirits! I am wishing I could grab a bite of that strawberry one & the s'mores one.... yummy!